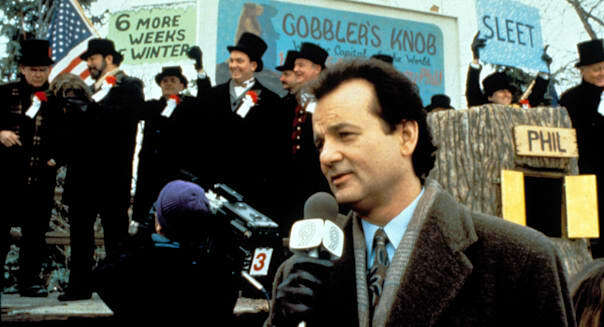 It was Groundhog Day on Wednesday here on Wall Street. Just in case you missed Tuesday session, you got to re-live it, with the Dow Jones industrial average (^DJI) edging lower but the Nasdaq posting solid gains. The Dow fell 41 points, while theStandard & Poor's 500 index (^GPSC) gained a point, and the Nasdaq composite (^IXIC) rose 17. AlamyWednesday was cold, snowy, and the stock market did just what it did the day before: Someone call Bill Murray. IBM (IBM) was the big drag on the blue chips, losing 3 percent. Once again, Big Blue reported disappointing revenue. Barclays and JPMorgan cut their price targets on IBM's stock. Chipmaker Advanced Micro Devices (AMD) tumbled 12 percent. It posted a profit but warned that revenue in the current quarter will be weaker than expected. Rival chipmaker Intel (INTC) fell one percent. But Texas Instruments (TXN) gained 2 percent. Its net beat the Street, and the company plans to cut costs by eliminating 1,100 jobs. Earnings news continues to drive some of the biggest price moves. On the downside: Coach (COH) fell 6 percent as sales plunged, especially for its handbags and accessories. Monsanto (MON) fell more than 2 percent. Textron (TXT), best known for its Cessna planes, rose 5 percent. And Brinker International (EAT) gained 6.5 percent. It operates the Chili's and Maggiano's restaurant chains. %VIRTUAL-article-sponsoredlinks%Elsewhere, Blackberry (BBRY) -- which was left for dead not that long ago -- rose 8 percent. Over the past month, it's shares are up 44 percent. The company plans to sell most of its real estate holdings, and it recently announced a big contract from the Pentagon. Illumina (ILMN), which analyzes genetic sequencing, has become a big momentum play. It rose 2.5 percent on the day and it's up 35 percent in the past month. But check out one more stock: Target (TGT). It's at a 52-week low. One big problem: a loss of trust with shoppers after the massive breach of their financial information. Finally, Luna Innovations (LUNA) nearly doubled in price today after agreeing to sell a key fiber optic technology. Labor Department releases weekly jobless claims, 8:30 a.m.
Freddie Mac releases weekly mortgage rates, 10 a.m.
Conference Board releases leading indicators for December, 10 a.m.
National Association of Realtors releases existing home sales for December, 10 a.m. Discover Financial (DFS), after the market closes. McDonald's (MCD), before the market opens. Microsoft (MSFT), after the market closes. Nokia (NOK), before the market opens. Southwest Airlines (LUV), before the market opens. Starbucks (SBUX), after the market closes. United Continental Holdings (UAL), before the market opens. Interest rates are low, but that's no excuse to accept 0.01 percent interest rates on your savings. Just a little shopping can find you many FDIC-insured savings accounts paying as much as 1 percent in interest, usually with no fees and easy availability to your money through electronic funds transfers. Compared to the near-zero rates that uninsured money-market mutual funds and other alternatives pay, high-interest savings accounts are a much safer way to save. Banks still try to get customers to pay more for less, with one recent threat to charge fees for basic deposit accounts if the Federal Reserve cuts interest rates further. But many online banks not only offer fee-free options on their checking and savings accounts but also pay interest, and many have extensive fee-free ATM networks or reimbursement arrangements. If your bank follows through on threats to raise fees, taking your business elsewhere is your best move. Bankrate reports that the average credit card charges around 16 percent in interest. That's a guaranteed money-maker for the banks that issue cards, but a big loser for those who carry balances on their cards. With many cards offering promotional interest rates as low as 0 percent, using them to get rid of high-interest cards is a no-brainer move and can help you pay your debt down faster. Mistakes on your credit history can keep you from getting a loan that you want to buy your next home or car, but they can also have consequences you'd never imagine. Increasingly, insurance companies, apartment rental agents, and even prospective employers order copies of your credit report to see if you're financially responsible. Be sure to take advantage of your free credit check at the government's annualcreditreport.com website to make sure the three big credit-rating agencies have everything right before mistakes come back to bite you. Payday loans have gotten more tightly regulated recently, but banks and other financial institutions still offer ways to let you get quicker access at your cash -- for a hefty fee. Resorting to short-term money fixes can land you in even more problematic situations down the road, because those solutions often create debt spirals from which it's hard to emerge unscathed. Set up an emergency fund instead and be prepared in advance for the money woes that life throws your way. Interest rates have risen during the last half of 2013, with a typical 30-year mortgage carrying a 4.5 percent interest rate. But many homeowners still carry higher-interest mortgages from before the financial crisis. Now that home prices have risen, you might be able to refinance for the first time, and many homeowners have used lower rates to cut hundreds from their mortgage payment or shift to a shorter-term 15-year mortgage to pay off their debt faster. Too many people never update their insurance coverage to deal with changes in their coverage needs, whether it comes from changes in family status for life insurance, health conditions for health-care or long-term care insurance, or even what types of property you own for homeowners' insurance. Don't wait for disaster to strike; check with your insurer or agent to see if your current coverage meets your needs. In the past, investors had to pay hundreds or even thousands of dollars just to make a simple stock purchase. Now, though, the rise of discount brokers, low-fee index funds and exchange-traded funds, and freely available investment news and advice have made it silly to spend large amounts to get access to the financial markets. If you're still paying your broker too much to invest, look into alternatives that can help you avoid cutting serious money out of your retirement nest egg. Everyone likes a tax break, and one of the best ones for you to use involves making contributions to a tax-favored retirement account. By putting money in an IRA or 401(k), you can reduce your current taxable income and save on your taxes while also preparing for the future. With 401(k)s, your employer might even chip in a bit on your behalf. Even when times are tough, finding even small amounts to save can put time on your side and make a big difference down the road. Many investors found out the hard way this year that bonds aren't as safe as they thought, with some major bond funds posting double-digit percentage losses in 2013. Despite those losses, bonds still carry substantial risk in 2014, with many calling for imminent interest-rate hikes that would erode their value further. Even now, bond rates are so low that they don't compensate you much for their risk. If you pay full price for just about anything these days, you're paying too much. The rise of deep-discount stores has led to falling prices at stores and shopping malls. Moreover, online tools like coupon sites, daily-deal offers, discounted gift cards, and cash-back credit-card deals can cut your costs as well. With all these tools, you won't find many situations in which you have no chance of getting a bargain on the items you want. In the past, many young adults focused on getting into as strong a college as they could, figuring that their degree would pay them enough to make up for the costs they incurred. With college graduates facing a more challenging job environment than ever, smart students are thinking about college costs before they make a decision on a school. By maximizing financial aid and looking at lower-tuition schools with nearly as strong educational quality, you can avoid creating a big debt hole that you'll struggle with for years into the future. If you don't have a will, a power of attorney for financial and health-care matters, and an advance directive to tell medical professionals whether you want certain life-preserving measures taken if something happens to you, then you're putting your family at risk. Many people don't have even these basic estate-planning documents, but getting them in place is easier and less expensive than most believe. Get your affairs taken care of in 2014 and save your loved ones some big future hassles. Resolving to be more financially astute and to avoid common mistakes will help you get your finances in order more quickly. These tips should give you more money to help you meet all your financial goals.